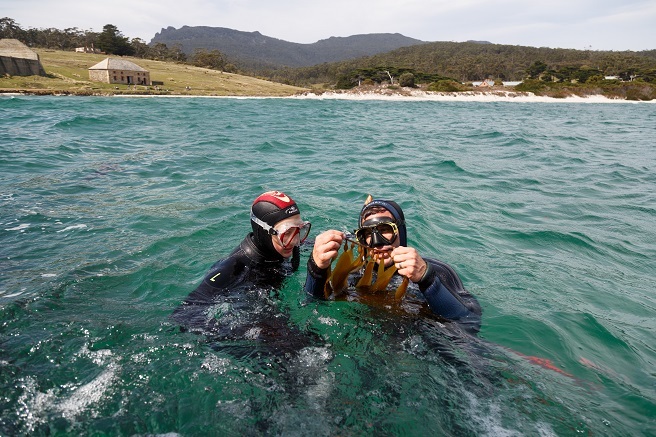 Year 11 and 12 students from around Australia have the chance to experience life as a marine biologist for a week on Tasmania’s Maria Island thanks to an IMAS course that is now open for applications. IMAS is offering four Tasmanian and five interstate students scholarships to attend the six-day course 'XAS101 A Practical Introduction to Temperate Marine Biology' free-of-charge during the April school holidays, while fee-paying places on the course are also available and can be offered to students who miss out on a scholarship. Running from Monday 23 April until Sunday 28 April, the course includes five days on Maria Island and one day at the IMAS building in Salamanca. The course usually costs $645 but is free for the scholarship winners, with those from outside Tasmania flown to Hobart to see the unique environment that Tasmanian students can access year-round. Students who wish to apply will need to demonstrate a keen interest and/or experience in the marine environment, or socio-economic or geographic disadvantage. Course coordinator Dr Scott Ling said the University Connections Program allows Year 11 and 12 students to experience university level units alongside their pre-tertiary studies. “The Maria Island course is always popular and each year we receive hundreds of applications from across Australia,” Dr Ling said. “This a fantastic opportunity for students from all over Australia to find out what it’s like to be a marine biologist and to experience marine science first hand. “They’ll enjoy a once in a lifetime experience on Tasmania’s East Coast while also learning how to collect scientific data in the field. “The students collect information on the abundance of fishes and invertebrates, which contributes to our ongoing monitoring of changes in eastern Tasmania. “This is a fascinating time to explore marine biology in the region as we are seeing major changes due to ocean warming, including the arrival of species usually only seen further north and their impacts on local ecosystems. "Students who do the course get to go diving as well as observing marine life along the shoreline and will develop keen skills of observation and an eye for detail. “Many of the students who’ve done the course enjoyed it so much that they’ve gone on to the IMAS degree program at the University of Tasmania, which is ranked as one of the best places to study marine science globally,” Dr Ling said. XAS101 is offered with a HECS-waiver meaning students will not attract any extra tuition fees, and successful completion can be used to contribute one unit (12.5%) to a University of Tasmania marine science degree. Scholarship applications close at midnight on Sunday 24 Feb 2018.